The capability of osmoadaptation is a prerequisite of organisms living in an environment with changing salinity. As a first response to a hyperosmotic shock K+ is taken up to counteract the loss of water, which otherwise would lead to cell death. Similarly, the maintenance of a steady cellular K+ concentration is essential for cell survival under K+ limitation. A key player for the K+ homeostasis in bacteria is the uptake system KtrAB. Though its physiological role in bacteria is well described we are lacking knowledge on the molecular function and regulation of this protein. The key question whether KtrAB acts as channel, transporter, or chimera of both remains to be answered. Our current research focuses on the elucidation of the structure-function relationship of the protein complex. 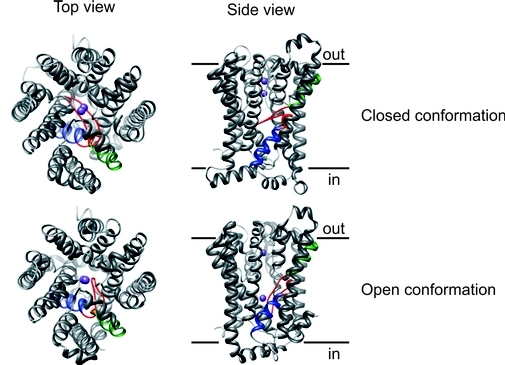 Structural and dynamic information is gained from cryo-EM, X-ray crystallography, and EPR spectroscopy while the nucleotide and cation dependency of the protein’s function is studied by electrophysiology and transport assays. Beyond the objectives of our present studies, one important factor – the changing composition of the lipid bilayer upon osmotic stress and its effect on the complex formation and activation – will be in focus of the newly proposed project. In vivo studies using fluorescence microscopy will elucidate the protein assembly and distribution in osmotically stressed and non-stressed cells, correlating with specific membrane compositions. This knowledge will be transferred to in vitro studies using EPR techniques, electrophysiology, and transport assays in which the protein activity and dynamics will be studied in dependence of defined lipid compositions. Ultimately, protein complexes, reconstituted into nanodiscs with defined lipid compositions, may be forced into new conformations, which will be elucidated by cryo-EM studies. In summary, we aim at suggesting a detailed transport cycle of KtrAB, which includes structures of the closed, inactive and open, active conformation of the complex and identifies the functional and structural roles of nucleotide, lipid and cation binding. Hänelt I#, Jensen S#, Wunnicke D, Slotboom DJ (2015) Low affinity and slow Na+ binding precedes high affinity aspartate binding in GltPh. J Biol Chem 290, 15962-72. Diskowski M, Mikusevic V, Stock C, Hänelt I (2015) Functional diversity of the superfamily of K+ transporters to meet various requirements. Biol Chem 396, 1003-14. Erkens GB, Hänelt I, Goudsmits JMH, Slotboom DJ, van Oijen AM (2013) Unsynchronised subunit motion in single trimeric sodium-coupled aspartate transporters. Nature 502, 119-123. Jensen S, Guskov A, Rempel S, Hänelt I, Slotboom DJ (2013) Crystal structure of a substrate-free aspartate transporter. Nat Struct Mol Biol 20, 1224-26. Majsnerowska M#, Hänelt I#, Wunnicke D#, Schäfer LV, Steinhoff HJ, Slotboom DJ (2013) Substrate-induced conformational changes in the S-component ThiT from an energy coupling factor transporter. Structure 21, 861-7. Hänelt I, Wunnicke D, Bordignon E, Steinhoff HJ, Slotboom DJ (2013) Conformational heterogeneity of the aspartate transporter GltPh. Nat Struct Mol Biol 20, 210-4. Hänelt I*#, Wunnicke D#, Müller-Trimbusch M, Vor der Brüggen M, Kraus I, Bakker EP, Steinhoff HJ (2010) Membrane region M2C2 in subunit KtrB of the K+ uptake system KtrAB from Vibrio alginolyticus forms a flexible gate controlling K+ flux; an electron paramagnetic resonance study. J Biol Chem 285, 28210-19. Hänelt I*, Löchte S, Sundermann L, Elbers K, Vor der Brüggen M, Bakker EP (2010) Gain of function mutations in membrane region M2C2 of KtrB open a gate controlling K+ transport by the KtrAB system from Vibrio alginolyticus. J Biol Chem 285, 10318-27. Kröning N, Willenborg M, Tholema N, Hänelt I, Schmid R, Bakker EP (2007) ATP binding to the KTN/RCK subunit KtrA from the K+-uptake system KtrAB of Vibrio alginolyticus: its role in the formation of the KtrAB complex and its requirement in vivo. J Biol Chem 282, 14018-27.